January 29, 2016 – More than two-in-five Canadians say the declining value of the loonie against the U.S. dollar has them cutting south-of-the-border travel out of their plans entirely, while a further one-in-four say they’ll travel less, according to the most recent public opinion poll from the Angus Reid Institute. At the same time, fully seven-in-ten Canadians say the low value of the dollar is hurting the country’s economy, their province’s fiscal fortunes and and their own pocketbooks. Traveling to the United States, whether for business or pleasure, is as Canadian as hockey and Tim Hortons. Canadians made more than 23 million overnight trips to the U.S. in 2014, a number more than 10 times higher than the total for the next most-visited country (Mexico). But with their dollar only worth 70 cents against the U.S. greenback, a Disneyland vacation or a getaway to New York many becomes harder for many families to justify. 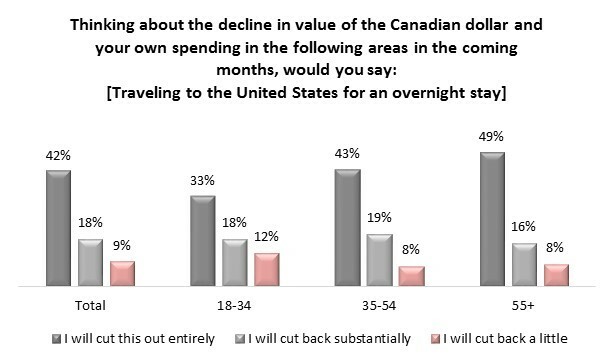 This is especially true for older Canadians (those ages 55 or older), half (49%) of whom say they will cut overnight travel to the U.S. out of their plans entirely. It’s not only overnight travel to the states the low dollar is affecting. Canadians are also scaling back their cross-border shopping trips. Fewer than one-in-five (19%) say the low loonie won’t have any effect on their plans to same-day shop in the U.S. Among those who say their plans will be affected, the vast majority (45% overall) say they’ll stop doing their shopping in the states entirely. This compares to 19 per cent who say they’ll cut back substantially and 6 per cent who say they’ll reduce these trips a little. Shoppers seeking relief by making more of their purchases in Canada may not find it. As has been extensively reported, domestic shopping is anything but immune to the effects of the low dollar. At the household level, the Angus Reid Institute finds the most pessimism, reflecting the above noted anxiety and retrenching of spending plans. Where about one-in-five Canadians see potential benefits to both their national and regional economies as a result of the dollar, a mere four per cent see the potential for their personal financial situations to improve. If even a glint of optimism is to be found, it is in the nation’s most populous provinces – Ontario, Quebec, and British Columbia – where roughly one-in-five see the low dollar as benefitting their local economies. Conversely, on the Prairies and in the Atlantic, approximately four-in-five see the dollar’s impact on their local economy as hurtful, while fewer than one-in-ten see a benefit, as seen in the graph that follows. In resource-driven Alberta, respondents see the situation as particularly dire. More than half (56%) say the low dollar is hurting their provincial economy “a lot.” No other region sees a majority choosing this most-extreme option (see comprehensive tables for more detail). It bears noting that the Canadian export economy represents nearly one-third (32%) of this country’s GDP. A low dollar is often seen as beneficial to exporters, because it makes the price of their goods more attractive to foreign buyers. That said, this argument doesn’t appear to have persuaded many Canadians about the potential benefits of a low dollar. Rather, the broad-based national pessimism noted in these survey results may well be driven by perceptions of how the dollar is affecting so-called home economics, and by the collapse of revenues from energy-related industries – realities reflected in daily headlines.